Chicken breast is the healthiest cut from the animal. It is loaded with protein and low in calories and fat. Extra virgin olive oil is high in antioxidants and healthy monounsaturated fats. Extra virgin olive oil is the oil that comes from the first press of the olives, offering higher flavor content than other types of olive oil. 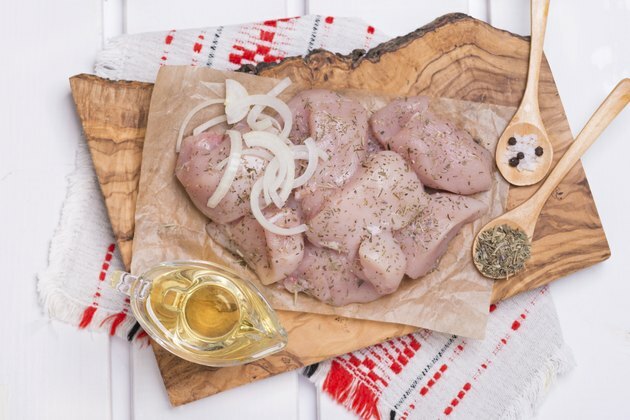 When you pair chicken breast with extra virgin olive oil and bake it in the oven, you will have a full-flavor dish that is rich in nutritional value. Pour the olive oil in a small bowl, and place the chicken breasts in the oil, covering the meat evenly with oil. Remove the chicken from the oil and allow the excess olive oil to drip off. Season both sides of the chicken breast with salt and pepper. Place the seasoned chicken breasts in the glass dish. Cover the dish with aluminum foil, sealing the edges well. Bake the chicken for 30 to 45 minutes, depending on the thickness of the breasts. Remove the dish from the oven and peel back the aluminum foil, being careful of any escaping steam. Insert a meat thermometer into the thickest part of the meat to ensure the internal temperature has reached 160 F. Cook the chicken longer if the temperature has not been reached. Add seasonings such as garlic powder or Italian seasoning to add more flavor and depth to the dish. Avoid possible food poisoning by washing your hands thoroughly after handling the raw chicken. Wash any surface the raw meat has touched to avoid cross-contamination and possible illness. Food Network; Baked Chicken With Cibatta Dressing; Aaron McCargo Jr.